Roller Skating takes practice, but soon after you get used to the feeling of having wheels on your feet and falling, it is time to learn how to maneuver by skating edges. 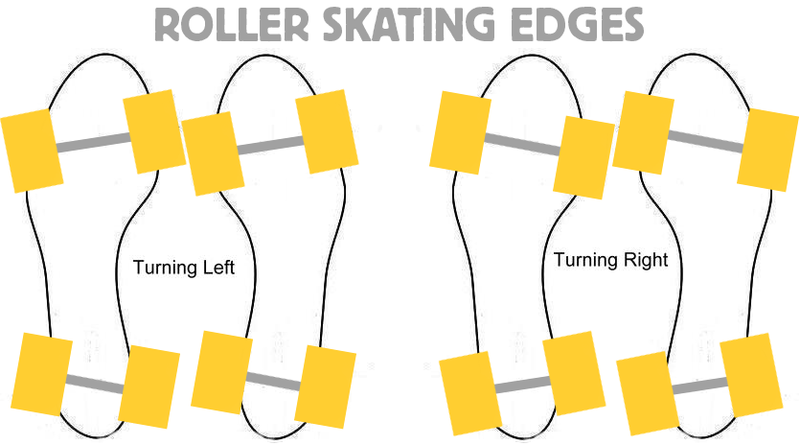 Edging by pressing different parts of your skates: When your foot is perfectly flat in a skate, you roll straight. If you have ever put on some skates, you may have noticed that your skates can begin to curve when you press on different parts of them. This is referred to as edging. When you are standing still looking at your skates you will notice that if you press on your big toes, (the insides of your skate) your trucks will curve inward. And if you press on your baby toes (the outsides of your skate) your trucks will slightly curve outward. These curves are called either inside edges or outside edges. As you get more comfortable rolling straight you can press these edges while you are rolling to curve! I am just writing to make you be aware of what a awesome encounter our child experienced going through your webblog. She mastered several details, including how it is like to have an ideal coaching mood to have many others easily fully understand specific impossible topics. You truly surpassed people’s expectations. Thanks for supplying such great, safe, edifying and as well as easy tips on that topic to Sandra.